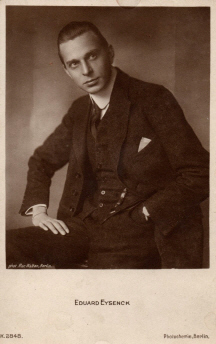 The actor Edward Eyseneck began his artistic career as a cabaretist before he appeared regular in movies as an actor from 1918. To his first movies belong "Kinder der Liebe" (18), "Der Weg, der zur Verdammnis führt" (18), "Halbblut" (19), "Störtebeker" (19), "Hyänen der Lust" (19) and "Cagliostros Totenhand" (19). For the last mentioned movie he was also responsible as the director. It was his only directed movie. His last cinematical works came at the beginning of the 20s into being. To these works belong "Schwarzwaldmädel" (20), "Lederstrumpf" (20), "Des Toten Rache" (20) and "Lotte Hagedorn" (21).